Entertaining a baby is deceptively hard! I had this delusion that I would continue to take my six-year-old to all of his normal activities and the baby would just come along for the ride. I had pictures in my mind of the baby calmly playing at my feet while I cooked or sitting contently in my arms while I taught my son math. I obviously had completely forgotten what it was like to have a baby! It turns out that I am desperately in need of help playing with my baby. I would love to give her one-on-one attention all the time, but being a parent to two children makes that impossible. So I need to rely on things like toys once in a while. The small stash of baby toys that I have were great for a while but she quickly became bored with them. 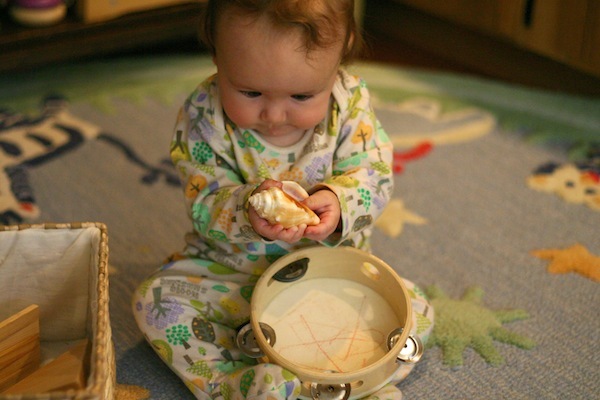 Fortunately, a blog called Nothing if Not Intentional introduced me to a great idea called Heuristic Baby Play. 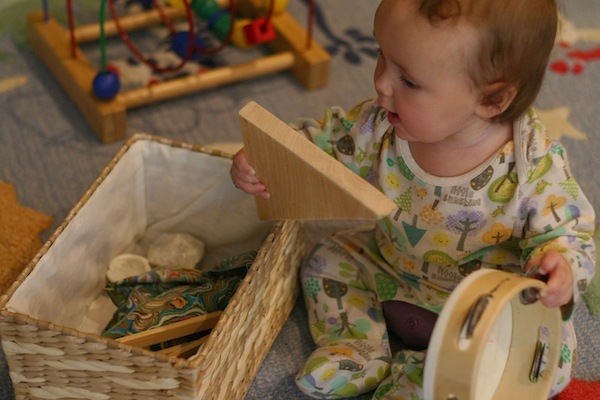 The concept of heuristic play is that you give your baby natural and found objects to nurture their curiosity, like when they play with the box more than the toy. 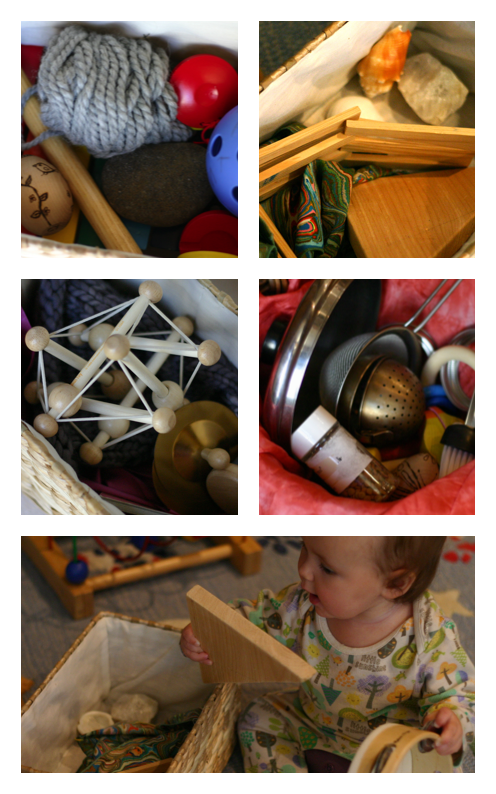 Babies and toddlers want to fill, stack, knock down, examine and feel objects. And they love to play with the same objects that they see the grown-ups using all the time (which is why I can’t put away the dishes while my daughter is strapped to me)! 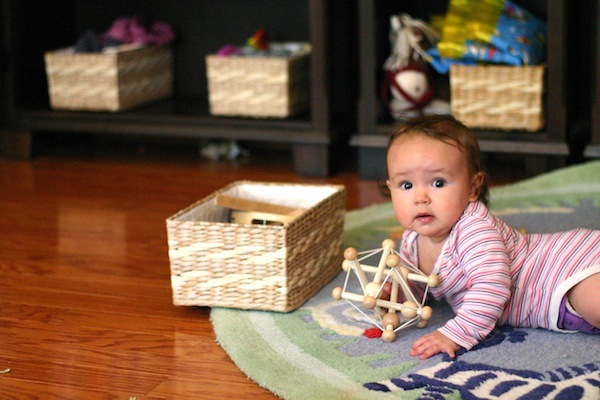 Heuristic play appeals to me because I like to use it as an opportunity to expose my daughter to objects from nature. Plus, it’s a lot cheaper to hand her a whisk and a spoon rather than go out and buy some overly colorful toy that she will hardly use. 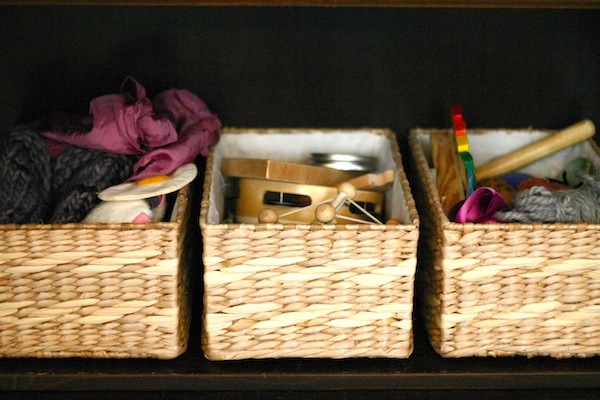 I keep the baskets on the bottom shelf of a bookcase (which is firmly attached to the wall) that is in baby’s play space. And of course, the baby loves playing with them! I rotate the baskets each day so she doesn’t get bored. Looking for other baby and toddler play ideas, check out my Pinterest board.